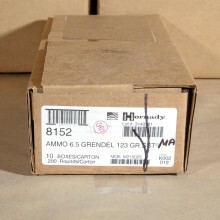 Bulk 6.5 Grendel Ammo Ships Free at AmmoMan.com! 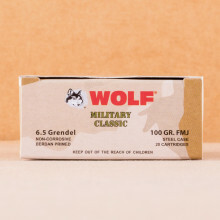 6.5mm Grendel ammo was designed to create an effective AR-15 cartridge at up to 800 yards. The same length as more common AR-15 rounds, 6.5 Grendel rounds feature more powder and a higher ballistic coefficient than traditional AR-15 rounds. 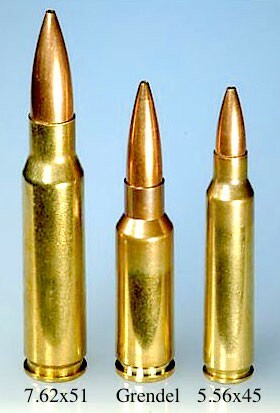 6.5 Grendel was originally a trademarked term and cartridge owned by Alexander Arms. The company gave up the trademark when SAAMI officially recognized the cartridge. 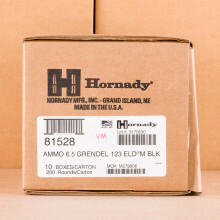 These days, you’ll find 6.5 Grendel ammo for sale in various bullet weights, typically ranging from 90-grain to 130-grain. With these rounds, you can expect muzzle velocities ranging from about 2,510 feet per second on the heavy end to 2,880 feet per second with lighter projectiles. As for the different bullet types, you can find great full metal jacket (FMJ) rounds designed mostly for plinking as well as specialized bullets with hollow point or more sophisticated bullets, like Sierra Matchking, that are ideal for hunting. While 6.5 Grendel is very close to 5.56, it’s not identical and you will have to make some changes to your AR-platform rifle if you want to shoot the larger Grendel round. For a better idea of the size comparison, be sure to take a look at the image pictured at right. Specifically, 6.5 Grendel will require you to pick up a Grendel bolt and barrel for your Armalite rifle. It's not too problematic and definitely something you’ll want to consider, especially if you’re a hunter that would like to bring his or her AR into the field. 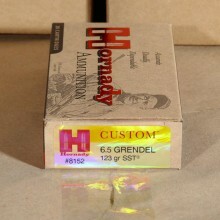 Look for in-stock 6.5 Grendel ammunition from known manufacturers like Hornady and Wolf here at AmmoMan.com. Alexander Arms also produces a considerable amount of 6.5 Grendel to this day.